1. Preheat the oven to 200˚C, gas mark 6. Bring a large pan of salted water to the boil and add the potato. Simmer for 4 minutes, then drain. Meanwhile, on a large chopping board, lay out 3 overlapping bacon rashers and top with a rosemary sprig; repeat alongside with the remaining bacon and rosemary. Halve the cod loin and lay a piece on top of each bacon section. Wrap the bacon around each cod portion. 2. Heat the oil in a large, heavy-based frying pan over a medium-high heat. Fry the cod parcels seam-side down for 1 minute, then turn over and fry for 2 minutes. Transfer to a roasting tin, seam-side down, and roast for 10 minutes. 3. Meanwhile, add the potato to the frying pan and fry, stirring, for 2-3 minutes. Add the leek and fry for 2-3 minutes until softened. Add the peas and stock, then simmer for a further 2-3 minutes. 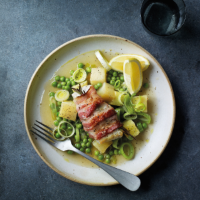 Season and serve with the cod parcels on top, with lemon wedges to squeeze over.